After a lengthy hiatus from playing the deck, I brought Colorless Eldrazi Stompy to SCG Regionals last weekend, and duked it out with around 250 players over nine rounds of Modern. I ended up finishing in 9th place. Despite my Top 8 miss, it was exhilarating to again play Colorless at this level. This report seeks to give an idea of how the deck performs in the current Modern metagame and my thoughts on the list going forward. Regionals marked my first Competitive REL outing with Colorless Eldrazi Stompy since the Worcester Classic in March, not counting one PPTQ this summer. In the meantime, I’ve been playing Counter-Cat and other brews in the smaller tournaments I frequent. I altered my list from the last Matchup Guide to account for this lack of practice, adding cards to help fight decks I had no experience against. I had yet to face Dredge and didn’t want to lose to that matchup, so I took my own advice and cut the fourth Bomb and the Sorcerous Spyglass from the side for a pair of Ravenous Traps. Gemstone Caverns #3 also moved main to make room for another Spatial Contortion, a hedge against Humans and Spirits. It usurped the second Scavenger Grounds main, which I feel is too slow to reliably hose contemporary graveyard decks without Simian Spirit Guide or a fast Thought-Knot Seer as backup. Grounds is better against fair decks as a way to nerf Tarmogoyf, complicate Snapcaster Mage plays, or recur Eternal Scourge. The Contortion came in handy, but I ended up not boarding in Ravenous Trap a single time during the tournament, and didn’t even see one Dredge player in the room. I would also have brought Trap in against Arclight Phoenix decks, BR Hollow One, Bridgevine, Ironworks, and Storm. (Play; MPM 5 – 7): I’m on the play. I mull to 6, Powder for 6, and then mull to 5; my opponent does not mulligan. (Draw): I’m on the draw. Nobody mulligans or Powders. (Play; P 7ss – MM 5): I Powder for 7 and end up with two copies of Eternal Scourge in exile. My opponent mulligans twice. Game 1, W (Play; 7 – M 6): I open Temple and curve out normally with Reshaper into Thought-Knot. Seer reveals Cinder Glade, Windswept Heath, Stomping Ground, Valakut, the Molten Pinnacle, Anger of the Gods, and Lightning Bolt. I take the Anger so my opponent has more trouble removing Matter Reshaper next turn. He ends up Bolting the 3/2, which flips a land, but never casts anything else significant all game and concedes as I continue deploying threats. Gut Shot is great at removing Sakura-Tribe Elder as a blocker, and at finishing off Baloth, Titan, or Chandra in a pinch. Surgical can sometimes nab all the Valakuts in conjunction with Quarter, but another Spatial may be better. Game 2, L (Draw; M 6 – M 6): After a round of mulligans, I slam a bunch of Eldrazi off Temple and disrupt my opponent’s hand. Dismember takes out Obstinate Baloth and I attack him down to 1 life with manlands in play, but he rips Scapeshift on his final turn to steal the game. Game 3, W (Play; P 7 – M 6): I keep a seven with three Temples, Seer, and Reshaper, and soon draw a second Reshaper. My turn one Temple is chased by a second Temple and the Seer, which sees a bunch of lands and exiles Summoner’s Pact. Next turn, I cast two Reshapers, and my opponent concedes when I attack him for 10. Takeaways: Based on my encounters with Scapeshift over the last year, this matchup feels much better than I initially pegged it. As usual, the key to success lies in aggressively mulling for a certain kind of hand: Scapeshift requires a highly proactive one. I’d never keep a hand of five or more cards without Temple, Mimic, or Seer in this matchup. Game 1, W (Draw): My opponent leads with Raging Ravine tapped, and I play a Temple. Reshaper resolves next turn, and my opponent summons Dark Confidant. I Dismember the Bob and swing with Matter, which dies to a Lightning Bolt; it flips a second Temple, so in second main, I cast Thought-Knot Seer, seeing Liliana of the Veil, Scavenging Ooze, Swamp, Forest, Stomping Ground, and Bloodstained Mire. I take Ooze and play Smuggler’s Copter for protection. I crew Copter with Seer to save the 4/4 from Liliana, then play another Copter. Seer gets Pushed, but Copter starts activating each turn to hit my opponent down to 12, then to 9, then to 6. He concedes to a Smasher. Game 2, L (Draw): We trade resources for awhile and I establish Relic-Scourge. But I forget I have Scourge in play when his Bloodbraid Elf cascades into Tarmogoyf, and miss a crucial block (he casts four Elves this game). The mistake gives my opponent a narrow win some turns later. Game 3, W (Play; MP 6s – 7): I keep a one-lander with Temple-Relic and miss a land drop, but then rip one and cast Scourge from exile. My opponent’s creatures eat kill spells in the meantime. I eventually let him keep a Scavenging Ooze, as the graveyards have been exiled. This is a longer game in which my opponent resolves 4 Liliana of the Veil (Seer crucially exiles a Liliana, the Last Hope). The walkers keep dying to Blinkmoth Nexus after minusing, and Mutavault is joined by Seer towards the end to close things out, trading with a reluctant Ooze. Takeaways: My opponent apparently didn’t have Assassin’s Trophy in his deck, but I have played the Jund matchup a bit with it legal and hold that it’s still a great matchup. 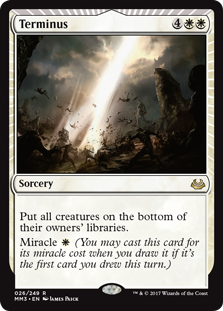 Trophy ramps us into our big spells and Scourge turns, and they are usually forced to burn it on three-drops, Temple, or Relic anyway. One-mana removal spells are actually better against us. Game 1, W (Draw; MPPPPMMMMM 1ss – 7): I almost keep a six-carder with Gemstone and Scourge, but end up Powdering it. The other hands are clear Powders or ships; towards the end, they stop having lands. I end up with a one-carder of just Eldrazi Mimic and scry Smasher to the bottom. Amazingly, my draw for turn is Eldrazi Temple, and instead of killing the Mimic, my opponent cracks Flooded Strand and casts Opt. On turn three, he casts Blood Moon, putting me another turn behind Eternal Scourge. I never draw Wastes and all four of my Powders are gone, so Seer, Reshaper, and Smasher rot in my hand all game. Mimic gets Electrolyzed, and I make two more land drops to resolve the first Scourge. My opponent proceeds to cantrip through his deck and Remand the occasional spell as I attack each turn. He’s on some UR deck and seems stuck on four lands (two Islands), so I assume Through the Breach (or Cryptic Command) is on the way. Instead, he casts Pia and Kiran Nalaar, which I Dismember before the tokens can bounce my Scourges. Five mana merely yields Snap-Electrolyze and a Jace, Vryn’s Prodigy, and my 3/3s get there. Game 2, W (Draw): I play a perfectly normal Temple game with a three-drop and a Seer, which just shows me two Islands when it finally resolves around turn five. My opponent cantrips some more and I get to Dismember a Young Pyromancer. Game 1, L (Draw): My opponent is Dylan Hand, who I consider among the most competent Humans pilots in Modern. As I already deem this matchup bad-to-close, I’m not optimistic about my chances, and Dylan doesn’t disappoint. I keep a solid Temple hand which he reads fluently with a pair of Meddling Mages, shutting down Seer and then Smasher (stranding three fatties in hand) after I cast Powder to bring myself to five mana. His Phantasmal Image copies Reshaper, and blocks mine to reveal Mantis Rider. Mayor of Avabruck makes the clock too fast for my late Dismember to matter. Game 2, L (Play): Another Temple hand from me, but with no removal. Instead, I have Mimic, three-drop, Seer, Smasher. In practice, this sequence doesn’t beat the Hierarch, Champion, Lieutenant draw from Humans, and a double-exalted Rider again soars over my monsters after Meddling denies Smasher. Takeaways: We should mulligan into removal post-board, especially since we keep Serum Powder. During almost every part of the second game, any kill spell would have turned things around. In my matchup analysis, I may have underestimated Meddling Mage. Game 1, W (Draw): I begin with Gemstone Caverns in play, exiling Scourge. Despite not having Temple, my hand curves out admirably, chasing Mimic with the Scourge and then Seer. For his part, my opponent fails to lead with a one-drop, which makes it impossible to race me. While swinging, I throw Dismembers at his guys on my end steps after he flashes them in, and a Smasher wraps things up. Game 2, W (Draw): My opponent again misses his accelerant and patiently makes land drops to three mana, with me Gut Shotting his Rattlechains along the way. I kept a removal-heavy hand with Smuggler’s Copter. Instead of slamming guys into the Spell Quellers, I animate Mutavault and hit with Copter a couple times, and my opponent flashes in Queller on my end step the second time I do. By then, I’ve looted twice, and promptly Dismember the Spirit. Next turn I run Seer straight into a second Queller, Dismembering this one as well to get a peek at the hand. I take Supreme Phantom, leaving a second one in the wings, and again crew and swing with Copter. Phantom soon comes down with a twin regardless, but my Ghost Quarter destroys Mutavault and forces my opponent to chump Seer with his 2/4s. Takeaways: No accelerant hurts Spirits enough that I think they mulligan low looking for one. The third Spatial is ridiculous in this matchup, as our removal snowballs just as their lords do. Gut Shot still the MVP. Game 1, W (Play): Temple, Guide, Guide ramps me into a turn one Thought-Knot Seer, which strips Noble Hierarch. My opponent is left with Mutagenic Growth, Apostle’s Blessing, Blighted Agent, Inkmoth Nexus, and Pendelhaven, and lacks a play turn one. I Dismember the Agent on his next end step and cast Smasher, attacking him down to 2. He goes to 1 fetching Dryad Arbor, draws, and concedes. We don’t need Eternal Scourge because our mana’s quite limited in this matchup, so we’re happy to merely cast what we draw. Pump spells otherwise blanked by Chalice can also become Vapor Snags against Scourge. Copter comes out for a similar reason: we can’t afford to constantly deploy threats for crew. Game 2, W (Draw): My opponent leads with Hierarch, and I respond with Temple, Mimic. He drops another Hierarch and an Inkmoth Nexus. I swing and hold up removal, but end up letting through 4 Poison in the air. I fail to make a third land drop, swing, and pass again. He boots up the Inkmoth and casts Might of Old Krosa in the main phase. I respond with Spatial Contortion, which meets Blossoming Defense. Spirit Guide exiles for R and I Dismember it, winning the counter-war; my opponent hits for 2 with Hierarch and passes. I cast Reshaper and beat my opponent to death with that and a Mutavault, finally making my third land drop on turn six or so. Takeaways: This matchup is as good as ever. The kill spells we play for Humans and Spirits are simply insane alongside the free win dimension of Chalice of the Void. Ratchet Bomb and Ghost Quarter don’t hurt, either. Game 1, L (Play): I lead with Temple and then Eternal Scourge, following that with Matter Reshaper. My opponent blind-rips Terminus and tucks my team. I tap out for two more Reshapers, but they eat Detention Sphere. Clique and Jace come down and I scoop. Further testing has led me to refine my sideboard plan for UW, now keeping Chalice to turn off Opt and Path. With those cards out of the picture, we can force opponents into pricey sweepers on our own terms. Powder comes out because we’re likelier to draw many copies in longer games, and want to be drawing bodies. Mid-round deck check race, W (Sunshine Airport): The judge denies my opponent a chance to use his cell phone, but grants us the ability to use the Switch. Things are a little rocky for me at first as I adjust to 100CC physics, and I drive into a couple crates and bananas. My opponent even passes me at one point and seems relatively unfazed by two straight Shocks. But then I get my bearings and Baby Peach ends up out-speeding Wario by a full four spots, with my opponent spinning into 5th just as our decks are returned. Cyber Slick wheels were mostly a meta call. Game 2, W (Play): My opponent again gets an early 2-for-1 with a blind Terminus, but I feel more in control with sideboard cards in the picture. I end up grinding him out the Eldrazi way: carefully deploying one Chalice at a time; committing creatures to the board so as not to pack it in to board wipes; nerfing planeswalkers with Mutavault and Copter. Seer’s able to snag a Crucible of Worlds, and I end this long game with plenty of fatties in hand. Game 3, L (Draw): This time around, I single-handedly lose the mid-game slog to a resolved Crucible, which my opponent uses to Field of Ruin me about six times. Lyra Dawnbringer resolves minutes away from time, and my first Dismember is Negated; the second one goes through, but a follow-up Baneslayer Angel spells my doom. Takeaways: I still feel okay about this matchup, although it’s by no means our easiest. We can answer what UW throws at us, and attack them with decent power from different angles depending on the game stage. My opponent had some amazing Terminuses, I made a few critical misplays in our last game, and Crucible of Worlds is a beating when we’re riding on a grind plan. Sorcerous Spyglass was also sorely missed this round, as it would have answered both planeswalkers and Field. Kelsey, on Counter-Cat, had also been 5-1 heading into this round. Unbeknownst to any Regionals players at the time, us x-2s would wind up just out of Top 8 contention. Game 1, W (Draw): After I exile a land to Gemstone Caverns, my opponent plants Verdant Catacombs and passes the turn. I go for Chalice on 1, which meets Stubborn Denial, and pay with Simian Spirit Guide. From there, Matter Reshaper keeps Tarmogoyf from attacking, as my opponent’s low on life from trading swings and cycling Street Wraiths; I end up winning with Blinkmoth pecks while sandbagging Reality Smasher. Just about all our hands are good post-board, and we want the games to go long, so Powder gets the axe for removal spells. Combined with Relic, these all take out Tarmogoyf, and they help kill a Shadow otherwise. Game 2, W (Draw): Turn one Inquisition of Kozilek sees Reshaper, Bomb, Seer, Zhalfirin, Mutavault, Copter, and Chalice, which it takes. Bomb comes down and trades for two Goyfs after I take a huge hit down to 9 life. My opponent rushes out a 3/3 Death’s Shadow to keep the pressure on, but I hit it with Spatial Contortion and then target it with Surgical Extraction on his draw step. He can never out-field me after that. Takeaways: Shadow’s only real out is to rush out multiple huge guys and kill us, maybe with Temur Battle Rage. That’s quite hard for them to do, as they lose to most of our cards post-board, especially Chalice, Relic, Bomb, and Scourge. Game 1, W (Play; P 7 – 7): Temple and Guide give me turn two Seer, which sees Path, Lightning Helix, Field of Ruin, Suflur Falls, Glacial Fortress and Saheeli Rai. I take the Path, and then cast another Seer to take Saheeli (by now, my opponent’s drawn a second copy). Temple eats Field of Ruin, so I cast Reshaper next, but Smasher’s not too far behind, forcing a last-ditch chump block with Felidar Guardian. Game 2, L (Draw; P 7s – 7): I build a big board and strip my opponent of resources, eventually coming to a critical turn in which I know his two-card hand of Saheeli and Guardian. Since I have Dismember in hand and my opponent’s on just four lands, I feel confident that he has no outs to my board. So I make a big attack, tap out to cast Powder and Scourge, and say “go” without playing my land for the turn. He combos me and I lose. Game 3, W (Play; PM 6 – 7): Temple lets me drop a bunch of Nacatls and I handily race my opponent, with Dismember taking out a Wall of Omens. Takeaways: I felt like I won all three games this round and am not sure how we could ever lose a match (given an awake pilot). Gut Shot and Dismember are way too good at disrupting the combo, and we don’t need to play around sweepers. Despite my lack of practice, piloting Colorless Eldrazi Stompy after all those months felt like riding a bike. And the deck itself impressed me, too: I did not expect it to be nearly as strong given how much better Modern’s become at doing what we do, AKA putting large dudes into play quickly. Another Colorless player even ended up in 5th at the same event. Although I didn’t face many dedicated graveyard decks, I think mainboard Chalice is still excellent, and wouldn’t trade it for Relics. Going forward, I’d like to swap a Blinkmoth and the last Grounds for two more Mutavaults. These should help in the control and combo matchups. There are fewer small fliers around without Signal Pest, and our fair matchups already seem fine without Grounds. We also have more cards in the side right now to fight small creatures and graveyard decks, respectively, and I’d like to keep it that way until I have a chance to at least cast Ravenous Trap once. As for the players continuously putting up 5-0s with the deck, I see you! Perhaps I’ll even score a 5-0 of my own one of these days. Until then, keep on flying that colorless flag! Jordan is the copy and content editor at Modern Nexus. He has played Magic since 2003, and Modern since its inception. Jordan favors card efficiency over raw power and specializes in disruptive aggro strategies. He always brings tuned brews to events. Congratulations on your results and thanks for the updated list ! I’ve been playing colorless Eldrazi for the last 5 months and it’s been a blast. I was wondering what your current counter cat list looks like, I’m relly interested in trying the deck. Not gonna lie, and I mean this in the best of ways. Eldrazi stompy gets me tilted. I thought it was achievement unlocked winning on a mull to 3 with this deck. Rad, and congrats. Always great seeing your results with the deck! I’ve had your 75 sleeved up ever since we played at the Worcester classic but never been able to commit to it at a large event. Maybe it’s time for me to put down the Ancient Stirring crutch and just mulligan better. Wishing you many sweet ships Collin! Ran your list last night at Monday Night Modern with the suggested changes at the end of your article to a 2-2 finish. Mulliganing with this deck is so much fun. * Looked 53 cards during mulligan decisions over the course of two games, addicted! * Game 3, loss, This was a really close game where I had the decision to add a Thought-knot seer to the battle field or Chalice on 1 against a tapped out opponent with a 0/4 crackling drake in play and 4 cards. Can you guess which line I took that lost me the game? * Do you have any suggestions on sideboarding against this deck? It’s on a rise in popularity. I stuck around after the event and play tested against Hollow One and UW control for about 4 hours. Luckily, you have ample content against the UW matchup which was a great help. I really just want as many man lands as possible against them. Hollow one revisited…I am having a really hard time against them. Game one feels unwinnable unless you are able to chain together some of your best draws. Sideboarded games I was able to try out a few different plans between going all in on graveryard hate, just the extra spatial contortions, sometimes cutting chalice and sometimes keeping it in. Do you have any suggestions on sideboarding against Hollow one, I couldn’t figure it out? Makes you mostly immune to Inquiry and not dead to Phoenix/Flameblade. HO cannot really beat Smasher, and Relic/Scourge creams them on defense (and eventually offense) too. Just make bodies and attack while they set up, then remove their blockers and seal the deal. Dismember hits everything they can produce. Chalice on 1 will screw them if you land it, and Relic neuters them too. Phoenix is their best card against us, but it’s not strong enough to warrant Ravenous Trap IMO. Thank you Jordan for the amazing content, as always! I have been playing a list with 2 walking ballista main deck and they have really exceeded my expectations (mainly at my LGS and 100-200 people tournaments at most). The card has so many applications that I may even consider going up to 3 or 4. Have you ever tested with them? Never, but will keep it on my radar! I worry that they are really bad in G1 overall because we tend to be very aggressive with our mulligans there to find Temple, and so are unlikely to produce enough lands for buff Ballistas. Plus they don’t apply much pressure against linear decks. Might be sweet out of the side for the small creature matchups though. Hi Jordan. Thank you so much for the write-up, very informative! The colorless eldrazi deck is new to me. I am an old-school player who recently got back into magic. Over the last year I’ve re-entered the game playing exclusively modern given how simplified and dull standard has become with the design direction WoTC has taken the new cards. So far I’ve played Ad Naus, Storm, and 8-rack. Now really interested in building Eldrazi aggro. My local meta is packed with Tron and I’d love to run something that maximizes Ghost Quarters. I wasn’t around for “Eldrazi winter” and don’t understand why this deck fell out of favor. This reddit thread (https://old.reddit.com/r/ModernMagic/comments/90i3v9/what_happened_to_colorless_not_tron_eldrazi/) from about 4 months ago asked the same question and it seems like the consensus was, “well, it’s fringe, but still really good and able to post results” so it feels like the question still stands. So here is my question: why do all the new colorless eldrazi lists run Eternal Scourge and Serum Powder? Eternal Scourge seems way too slow for the format and Serum Powder is just an awful card. Is making sure you have Chalice in your opener that critical? Check out this list (https://www.channelfireball.com/articles/quality-over-quantity/) from a CFB article from 2016. The main difference is that it doesn’t run the Scourge and Serum Powders, rather it has main deck ratchet bomb as well as packing a few Spellskites and Endless ones, which seems objectively better. I’ve also heard from colorless eldrazi players that one of the tougher match-ups is Humans, which would further make the case for the older list which packs ratchet bomb in the main. Would love to get your thoughts on this! I invented the deck, so check my backlog of articles on it. You’ll find answers to all your questions (and more!) in the archive. Good luck! I started play Colorless Stompy a while ago – your articles was really helpfull for me. Is there any chance to see updated sideboard plan for last changes? Great Xmas time to all Modernnexus readers! I mostly do my plans on the fly now depending on how opponents play and the techs I anticipate out of their decks. Check out my existing sideboard guides here if you haven’t, and the discussion on MTGSalvation for more specifics. Hey Jordan. I’m just coming back to the deck now since humans is no longer as prevalent on MTGO. Do you have any game play videos or streams with the deck? Nope, just heaps of written content! I may try to get into streaming in 2019. NOTE: Metagame % is calculated from the unweighted average of all MTGO leagues, paper T8s/T16s, and GP/PT/Open Day 2s in the date range. Data is tracked in the Top Decks page, which you can browse for more details.